DisplayPort is a new generation display interface technology. With this connector, notebooks and consumer electronic devices can be connected with big display screens. The growing popularity of the DisplayPort technology is expected to replace the VGA and DVI interface market, and to be widely used as a mainstream technology of the computer industry. Mini DisplayPort is used in the latest Apple notebooks and monitors. 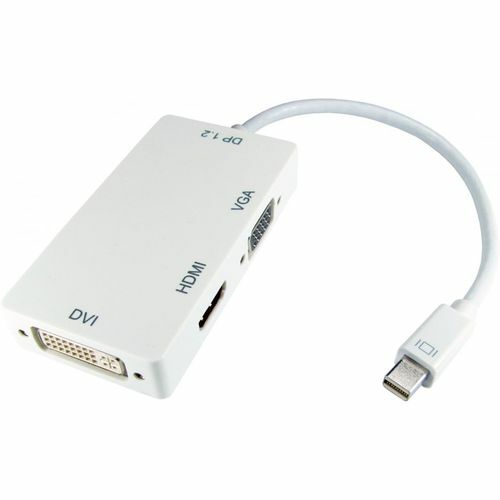 The HDMINIDP-HDV02 will allow you to connect a high definition monitor, projector or LCD TV to a MacBook, MacBook Pro or a MacBook Air with a Mini DisplayPort connection. It is easy and convenient to use, with three output ports: HDMI, DVI and VGA. You can use one of them at a time as needed.